well, V4 is over now, I mean, I might keep a few PCBs as spare parts or for personnal projects during the V5 design, but so far, since v1, many bugs and hardware details have been fixed, upgraded, improved. Honnestly, V4 is REALLY stable. My only current problem is the microcontroller, I can't figure out when I'm soldering them but *some* of them have a fragile on/off or aux button input. It's fine during the test then some people will end with a board that isn't responding to the on/off control, after soldering the switch. Excess of ESD is a possibility and... awful soldering guns. Think about investing in a 50 USD smd soldering station, and please NEVER use any sort of soldering so-called "gun" (pistol shape). I'm planning to get myself a Metcal station before I touch my CF with an iron. Ya don't work on a Rolls Royce with Wal*Mart tools! ...unless CF doing my taxes *IS* feasible. In which case, I'll happily pay $300 for a board, hahahah. make it my cell phone and yeah i'd pay whatever! well, V4 is over now, I mean, I might keep a few PCBs as spare parts or for personnal projects during the V5 design, but so far, since v1, many bugs and hardware details have been fixed, upgraded, improved. Honnestly, V4 is REALLY stable. a Sith gains understanding through power. Help me choose my Sith Sinktube Saber design! I actually do that...does that make me a geek? I got my first CF out of this last batch that Erv did, and I can’t even begin to express how impressed I am by it. I’ve been playing with it non-stop and all my other projects have taken a back seat. Fantastic job, Erv! You are to be truly congratulated Sir! And Novastar, your sound fonts are awesome and give a life of it’s own to CF. I can understand the amount of work that goes into them and you are to be commended for your love of this hobby. Offering suggestions on improvements is a difficult task, but if I had to, all I could offer would be a glimpse into the future. I imagine a saber that has a USB port of sorts built into the hilt where you plug it directly into a computer. From there you have a software program where you can setup all your fonts, configurations and downloads and even charge your batteries. 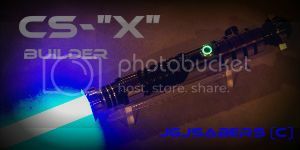 All CF come with stereo sound and a specially designed RBG led and optics that allow any of a million different color choices and there’s even a digital simulation of a saber and blade in the program where you can see and hear all your configurations changes prior to downloading them to the saber. With gig’s of storage space, the possibilities are endless. Thank you Guys for all your hard work and love of the hobby. I'm new to the CF, but I've definitely become a believer since getting my v4.1! To echo the rest, it's hard to find room for improvement. However, I will say that it would be nice to be able to load more sound banks onto a single microSD card. The vast majority of the card's space is unused, so I assume there is some CF limitation that is the issue here?